Since I never get the chance to say anything except beer-related commentary here, I thought I'd break that habit today just for a moment. Let's start with a question. Yankees, Rangers or Phillies? Such an easy question, too! Phillies, duh! Cliff Lee is back to the Phillies and part of a monster pitching rotation. So there are just two things I pray for entering the season. 1. Some bats that can score more then 3 or 4 runs consistently, hopefully mostly blowout wins; and 2. A ton of complete game wins. Why those two things? Because both make sure Wild Thing Brad Lidge stays seated in the pen! For now, back to the Flyers and Eagles! 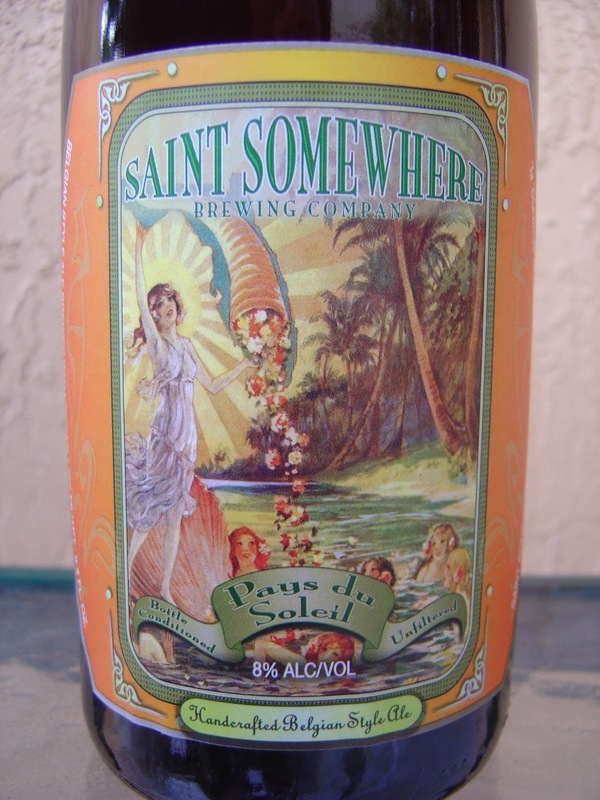 Last night, I was drinking Pays du Soleil brewed by Saint Somewhere Brewing Company in Tarpon Springs, Florida. This is a small brewery, and as far as I can tell, largely undiscovered and off the radar of beer geeks outside of Florida. The story on the back of the wine bottle lets you know they are a small batch brewer of traditional Belgian-Style ales. 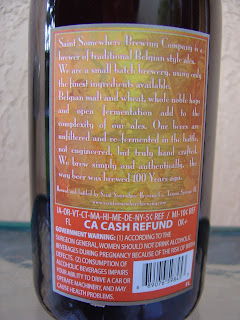 The cork was labeled with the brewery name and the year 2010. Beautiful, colorful presentation with a tropical cornucopia beach-bathing-beauties deserted-island scene on an orange background, if that makes any sense. Finally, if my six years of French are worth a damn, this beer translates to Land of the Sun. Fruity apple and pear, spicy cider aroma. The apple cider flavors continue on right from the beginning, tartness galore. Yeasty texture and flavors are also immediately noticed. There is quite a bit of funk matching up with the fruit; hay and cherries and dampness and flowers, all talking part. 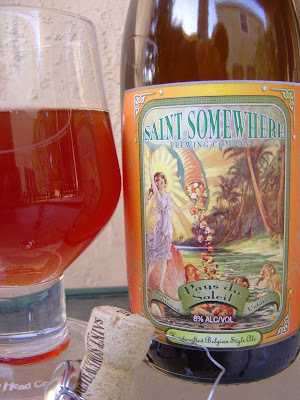 The consistency is a bit syrupy, with the fruits really grabbing on to that aspect. Some honey sweetness seems to be in a continuous battle with a dominant sour. Toward the end, you may ever-so-slightly notice the 8% alcohol, but it's mostly integrated and doesn't really stand out. The finish is dry and what's left behind is tart and sour. Speaking of left behind, there is also a lot of sediment at the bottom of the bottle and a little in my glass too, but that was fine. This beer grew on me from sip one until the end, getting better and better. Having the full wine bottle also gave me ample time (and liquid) to really think about this. If I recall, I enjoyed their Lectio Divina better, but this was an enjoyable beer you should check out! If you enjoyed this review or want to take a chance that I could do better tomorrow, consider subscribing to new content here. Imagine, by tomorrow morning you could have something fun in your inbox. Thanks a lot for reading!